Take a picture (a selfie, or ask a friend to help you out) of yourself, wearing your cool! new! Liaden gear, in. . .a bookstore. . .at WorldCon. . .in a hang-glider. . .at the top of Mount Washington. . .swimming with dolphins. . .at a family picnic — you see where we’re going with this, right? Right. What’s that you say? You don’t have any cool! new! Liaden gear? You may also play by taking a picture of you and one of the two! new! 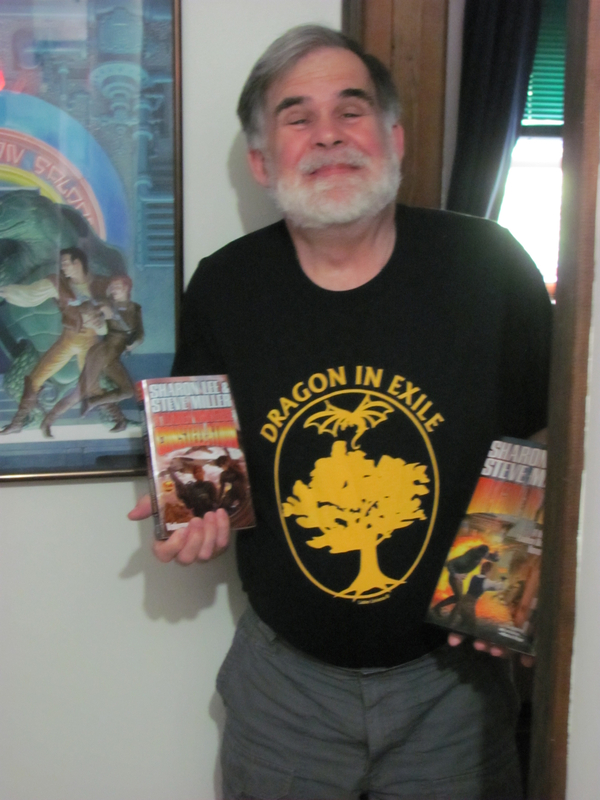 books just out from Baen — those being Dragon in Exile, and Liaden Universe® Constellation, Volume 3 — in exciting situations similar but certainly not limited to those listed above. If you are one of the few and the proud who still own your original green-and-gold Plan B tshirt, or the second-run navy-and-white I Dare tshirt — take a picture of yourself wearing this historic gear, and you will have a Bonus Point added to your entry. You didn’t think we just wanted you to take photos to post to your Facebook Wall, did you? Heck no! After you take that picture, we want you to send it to us! We’ll post it on korval.com, and every Sunday, starting August 23, we will choose a winner from all entries. OK, here’s the rules in 1-2-3 format. 1. Take a picture of yourself in your new or historic Liaden gear doing something interesting. ALTERNATIVELY, take a picture of yourself with one of the two new Liaden books doing something really interesting — but not dangerous! No, really. This isn’t worth getting killed. 2. Send that picture to liadenuniverse@gmail.com, be sure to include an email address that you check regularly with your entry. 3. Multiple entries are allowed, but! No more than one picture per day may be submitted. 5. On Sunday we will choose a winner, and the winning picture will be posted on korval.com in Isolated Glory. 6. In addition to Glory, the winner will receive a coupon for one free Baen ebook of their choice. 7. Contest starts Monday August 17 at 1:00 a.m. Eastern Daylight Time, and ends at noon EDT on Saturday, October 3, 2015. Pictures received before Monday August 17 will not be admitted to the contest. The last winner will be posted on korval.com on Sunday, October 4. Want to play, but don’t have a book? Look to the Uncle. Uncle Hugo, that is. Steve, doin’ it like a delm. A delm slightly in his cups, perhaps, but a delm, nonetheless. Sharon doin’ it like a delm. Those kids just can’t keep outta trouble on the streets, can they? The Do It Like A Delm Week Seven winning challenger is! We have a winner! Do It Like A Delm, Week Six! Do It Like A Delm Week Five Winner! Week Four Winner in the Do It Like A Delm Challenge is. . .
5 comments to Liaden Universe® Challenge! 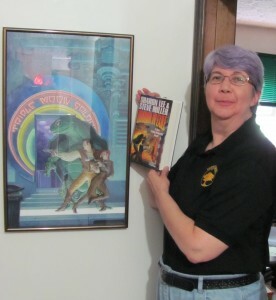 Hey guys, I am fairly new to the universe and to clan Korval, although I am consuming these books at a voracious and alarming rate. I have noticed that there is nothing on the web to instruct us barbaric Terrans on the proper way to bow to a Liaden, I mean like a step-by-step guide, pics or video. Lets make this happen so that we may not offend any Liaden Citizens we may encounter. maybe we could formulate the most basic of proper bows. If anyone out there knows of a site, or video that explains these things please let me know or shoot me an email!